Well, it’s at least thought provoking… especially if you can ignore such details as the radial spoked front wheel with disk brake and the lack of several important, practical details. Most notably, where’s the little fold down seat for a toddler? Thanks to Sjoerd of Double Dutch in Switzerland. Apologies for the lack of blogging action here at BeM. We’re just super busy with “business as usual” at Workcycles and taking turns going on holiday after lots of busy business as usual for many months. What’s new? Well, speaking of toddlers, lots of things though the most recent proud papa moment was 26 month old Pascal suddenly deciding that the balance bike (loopfiets) is cool after all. So he just got on and pushed off. A week later he’s tearing around like he was born on the thing. It’s quite surreal to see a two year old riding a bike. I haven’t had a chance to snap any photos yet so here are a couple just a week earlier of P1 demonstrating his mad scooter skills. He’s been riding this little Micro Mini scooter (€70 at Workcycles!) for 8 months already so the balance thing is already second nature; riding the bike was just a matter of doing the same on a different shaped vehicle. Actually he pedals a tricycle around at the daycare so, in principle, he could already put the two skills together and ride a pedal powered bike already… except that I don’t think there are any bikes small enough for such young kids. It’s doubtful he could reliably operate either a handbrake or coaster brake, so this little bike would probably have to be a fixed gear like the antique Dutch kids bikes we’ve restored. I have to admit liking the idea of building a teeny-weeny fixie, complete with mismatched wheels, top tube pad and a couple Knog lights but really, riding a balance bike until he’s three won’t exactly stunt his development. Sometimes he goes a bit overboard and takes a spill but thus far he’s never hurt himself. Mostly he laughs and just jumps right back on. I imagine it helps to have begun developing these skills at such a young age but anyhow, I suppose a toddler who’s trying to ride skateboards he makes from Lego blocks and wheels needs a little space. 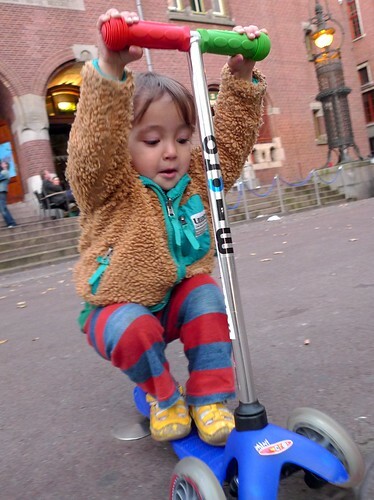 I first wrote about P1’s little scooter, balance bike and baby bakfiets half a year ago: Pascal has a bakfiets too. More importantly, what’s keeping us busy and me in a steady stream of proud papa moments is that we’re now a family of four. P1 is now Pia’s (P2) big brother. Here they are, snug as bugs in rugs, in the family Truckster (a.k.a. Bakfiets Cargobike). Pia’s napping in the Maxi-Cosi while Pascal no longer needs (nor wants) his toddler support seat (a Bobike Mini with its mounting equipment removed). 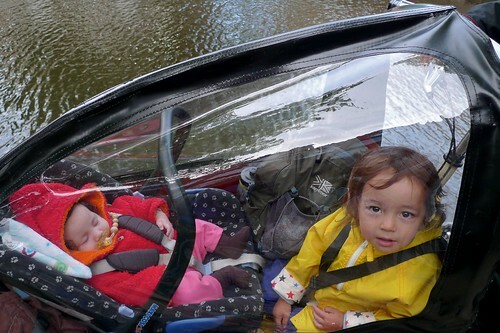 Here they demonstrate that kid(s) can sit on the bench together with baby in Maxi-Cosi, all weather protected by the canopy. As far as I’m aware Workcycles’ Maxi-Cosi carrier is the only way to do this. This entry was posted on Wednesday, October 20th, 2010 at 22:07	and is filed under Bikes in use, Child and family transport, Cool & Interesting bikes, Funny stuff, Henry and his family. You can follow any responses to this entry through the RSS 2.0 feed.You can skip to the end and leave a response. Pinging is currently not allowed. I think the front wheel is 2 cross spoked, not radial. Nope, definitely radial – look carefully. Wow this yellow thing is ugly! Like a Jail on wheels! hit by shopping bags again and again. I am wondering: Why are designers developing stuff, that anybody who has used actually woking things more than once, can deconstruct as non-functional, useless and stupid within five minutes? Wouldn’t it be a good idea to actually ride a working shopping bike for some weeks before designing your own? I can’t believe this was done here. In all fairness to this bike’s designer, I think (or rather I hope) it’s intended as a design study and on that level it’s at least fun. No, it’s not really practical but, once upon a time, I too enjoyed the conceptual freedom of being a design student. I do think there are some interesting ideas in this bike: Perhaps it’s possible to build a sort of cheap, monocoque basket frame, for example. I doubt it’d be a welded steel mesh like this but maybe it could be done in another material. A bamboo basket bike anybody? There’s a project for some creative do-gooders. 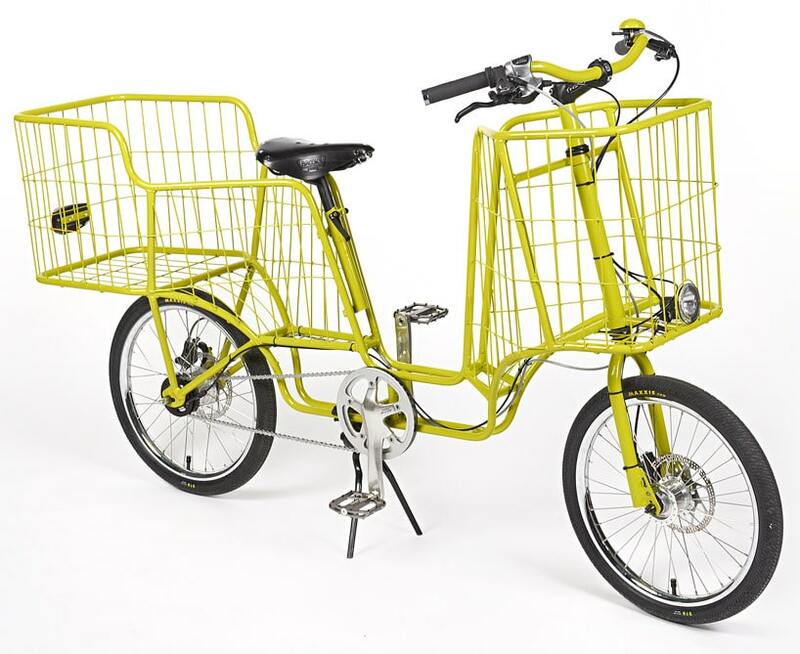 While reading about this abomination 🙂 i stumbled upon this http://francescycles.com/galleries/cargo/#2269719181 and i must say it looks quite interesting, especially the steering. Yes, the Frances bikes are really pretty and original. Convertible balance bike? Mini draisenne with pedal option? Here you go: https://www.flickr.com/photos/[email protected]/5118497285/ It’s a Micro Mini BMX frame built with 12″ wheels, and this two year old loves it. It should last a year or two, as well. I would have posted this sooner, but it took me a while to get hold of the picture – not my two year old, don’t you know. That’s very cute. It looks like a creative parent built their son a cool balance bike by combining a nice, little BMX frame (probably for 16″ wheels) with a pair of 12″ wheels. With very short cranks there might be enough pedal clearance to make it a pedal bike when the kid is ready. The downside is a relatively long wheelbase which makes the bike less handy for a little tike. Pascal’s been riding his balance bike in the most absurd terrain lately; basically doing trials up and down shallow stairs, over rocks and little grassy hills. His balance bike is very compact and weighs 2kg which makes this much easier. Keep in mind that a child of this age only weighs about 12-13kg. Actually, the frame is intended for 20 X 1 1/8″ wheels, which Dain (the dad and mechanic) indents to reinstall when it is time for cranks and pedals to be added. The aluminum frame makes the whole thing extremely lightweight (sorry, we didn’t weigh it before it went home), and the long wheelbase doesn’t seem to be a handicap; of course, he has no other experience to compare it to – he just likes it! 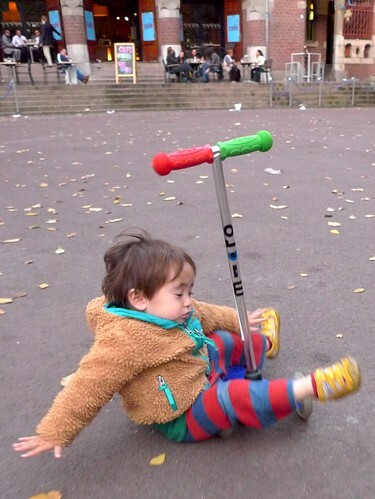 Kids are amazingly resilient and adaptable, as you know. I see you put a bobike mini on your bakfiets. Would you please explain how you do that? Where do you see a Bobike Mini on a bakfiets? There isn’t any in this post. In any case the Bobike Mini or any other front child seat can just be clamped as normal onto the stem (assuming he bakfiets has a stem). There just isn’t as much space between the handlebar and saddle as on a regular city bike so it’s not very comfortable for the bakfiets pilot.